Billy Law will already be familiar to those of you who follow his very popular food blog, A Table For Two. He also made it into the top 7 on Aussie Masterchef 2011. Born in Malaysia, he moved to Australia in the mid ‘90s to further his studies and has lived there ever since. On his blog, he explains that it was only when he moved, and missed the home-cooked dishes of Malaysia, that he took up cooking himself. These days, he cooks not only the cuisine of his native country but a wide range of Eastern and Western treats and there are plenty of both in his first cookbook, Have You Eaten? The book is named for the common Malaysian greeting – not “How are you?” but “Have you eaten yet?”, which shows a commendable focus on the importance of food in the culture. This appeals to me! One of the things I’ve long enjoyed about Billy’s blog is the beautiful food photography, which really shows off all his dishes so temptingly so it’s great news that he did the styling and photography for his book himself, bringing his trademark rich and warm style to the book. Recipes are easy to read and the whole book is a true feast for the eyes. Dishes are divided into sections called Snack Attack, On The Side, Easy Peasy, Over The Top, Rice & Noodles Sugar Hit and Dress For Success, most of which I found self-explanatory except for the last one, which was obvious once I looked – it covers dressings, of course! There are lots of recipes which appeal, from Guinness battered prawns to Pandan chicken, from Deep-fried salt and pepper tofu to Watermelon, baby tomato, chevre and candied walnut salad, from Breakfast pie to Ayam pongteh (braised potato chicken, from Beef Cheeks Bourgignon (using my favourite, Pedro Ximinez) to Burnt butter lobster tail with apple and salmon roe, from Claypot chicken and mushroom rice to Curry laksa, from Popcorn and salted caramel macarons to Gingerbread ice cream, from Wasabi mayonnaise to Chilli onion jam. And that’s just two from each section, there are many, many more that sound delicious. 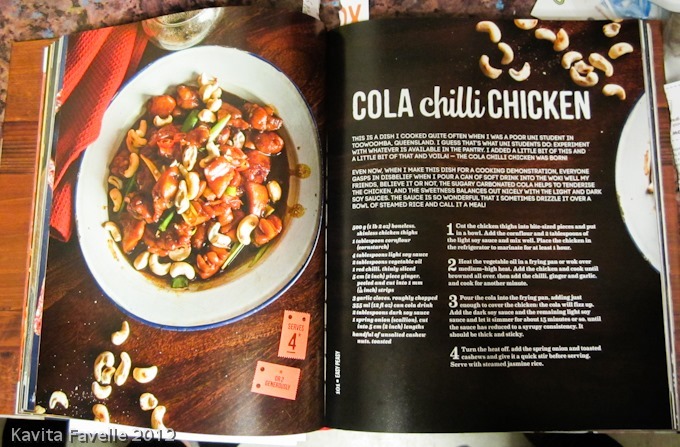 The recipe we decided to make first was Billy’s Cola Chilli Chicken, as I’ve been reading about savoury recipes featuring Coca Cola for such a long time. 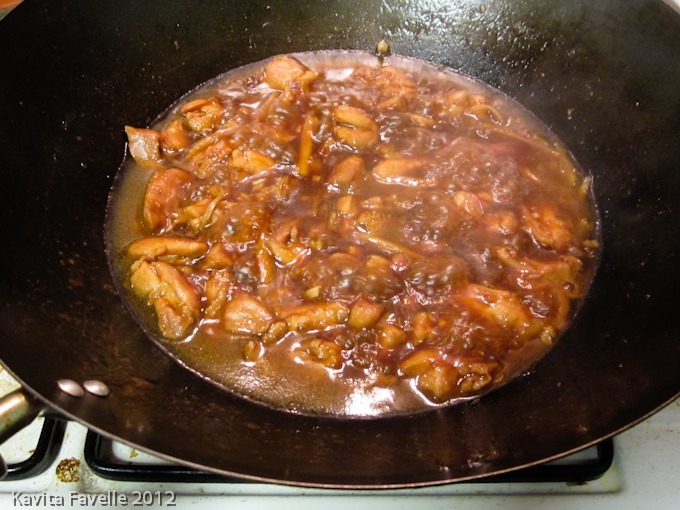 We skipped the cashews, as Pete’s not a fan, but otherwise followed the recipe as it was. We did find it needed quite a bit longer for the liquid to reduce down, but that may also be a factor of the size and shape of our wok and the heat we cooked over. Otherwise, it was very straightforward. The finished dish was absolutely delicious. The sauce wasn’t sickly sweet but beautifully balanced. Given how easy it was to cook, this is likely to be something we make again. And it makes me even more excited to try many of the other recipes in the book. Billy Law’s Have You Eaten? is currently available from Amazon UK for £16 (RRP £25). Kavey Eats received a review copy from Hardie Grant Books. 19 Comments to "Billy Law’s Coca Cola Chicken"
Well done, Kavey (and of course, Pete, too!) and thank you for the info on the chef, the cookbook and this specific recipe, too. Ginger ale sounds like a good soft drink to use for cooking, shall have to try that. I keep hearing about savoury cola recipes too and it’s something I think I will try eventually. I imagine it goes really well in Chinese-style dishes. 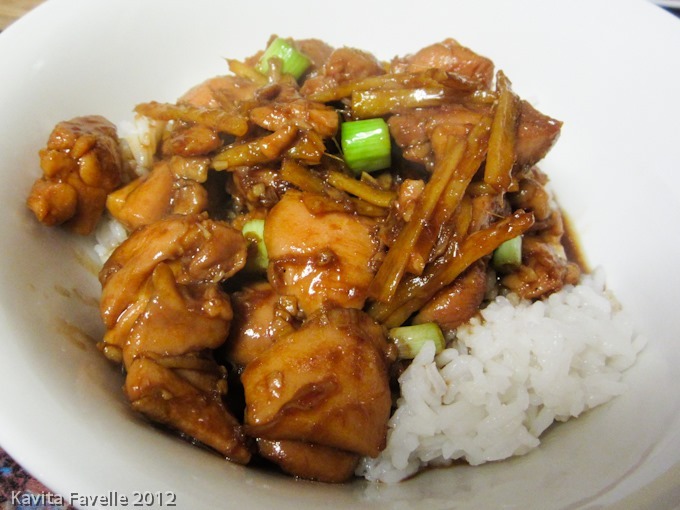 I’ve read about cola chicken before and been wanting to make it, but not got around to it. At Christmas I made a Barcadi & Cola roasted ham joint and it was just amazing. I’ve been reading about cola ham for ages but neither of us are huge ham fans so have never made it. 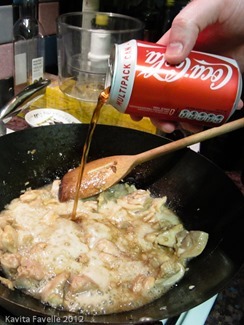 When I came across this one, I knew it was time to bring the coca cola into the kitchen! Knowing how well Coca Cola works with cooking big joints of ham I’m not surprised this is a success. It had not occurred to me to pair it with chicken but looks well worth a try. I hadn’t come across Billy before but I’ll look out for him now. Yes works very well, definitely recommend it, also very straightforward to make. This sounds really delicious – I’ve tried the Nigella coca cola ham but I’m intrigued to see how it works with chicken. Definitely a book to look out for! I have come across the ham recipe, but I’m not a huge ham fan, so I’ve never tried it. Chicken thighs, on the other hand, and I’m at the front of the queue! I had no idea Billy Law had a cookbook out! The recipes do all sound great. I’m currently watching Billy in Masterchef as I missed it first time round. I have his pork belly dish bookmarked to try and now have put this book on my wishlist. Actually, someone I know online is bringing me back Chris Badenoch’s book from Australia whilst she’s there over Easter, as it doesn’t seem to be available here and I fell totally in love with him last year! Was looking for a different dish and this turned out very tasty. I did do an all day marinade and use red onion rings rather than spring onions. I will certainly be looking out for the book. p.s. I skipped the cashews too – not that I don’t like them just prefer them nibbled with an aperitif before the meal not during it! So pleased you liked it… and interesting that you did an all day marinade. Am thinking one could easily prepare up to the marinade and then freeze the chicken in bags, in the marinade, ready to finish the recipe another time?